Imagine Foundations at Morningside Public Charter School provides a challenging learning environment for students in kindergarten through eight grade. 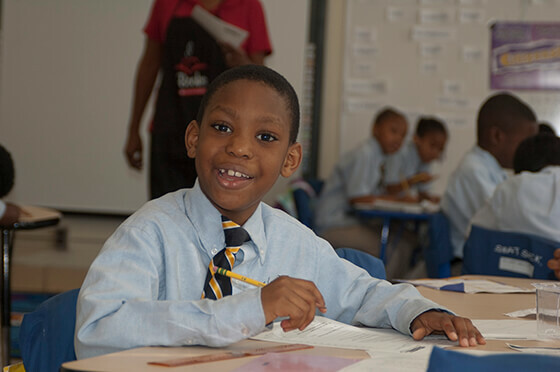 Imagine Foundations at Morningside is modeled after the successful and award-winning Imagine Foundations Public Charter School located in Upper Marlboro. The new school utilizes the same curriculum and operates in accordance with the Imagine Foundations philosophy. The mission of Imagine Foundations at Morningside is to develop dynamic individuals through hard work, academic achievement, and character education. Our vision is to create a school environment that helps students gain academic confidence, strong character, determination, and the academic skills necessary for entrance into university. Content Rich Curriculum: Through the adoption of the Core Knowledge sequence, we provide students with an integrated educational approach that places a heavy emphasis on classic literature, mathematics, geography, art, physical education, and music. Culture That Shapes Character: We consciously and rigorously work to develop the character of every Imagine Foundations at Morningside student by dedicating the first 20 minutes of each school day to the teaching of positive character traits. We reinforce these teachings by incorporating character-forming rituals throughout the school day. Students also benefit from having monthly prominent character education speakers and award ceremonies. Meaningful Community: We teach students the importance of community by working collaboratively with our parents, guardians, and local community stakeholders in pursuit of our mission.